There I was, in the midst of a foggy tunnel surrounding my head, in heavy communication with God. I was alone, scared and in great need of His strength. I was incapable of gaining strength on my own. Yesterday was a hard day. I went in for my follow-up visit to my doctor. The purpose of this was to go over my blood work and the diagnosis was um, not the worst, but not the greatest. First of all, I do not have Celiac. I might be a little allergic to wheat but I can have gluten. I was misdiagnosed with that six months ago. That’s part of the good news but to re-introduce gluten into my diet, I will get diarrhea and stomach pain. Yuck! Is it worth it? I have to give that thought. The bad news was that I was diagnosed with Rheumatoid Arthritis. I have a rheumatologic disorder, and some possible MS creeping in. But the real kicker was that while I was there, I asked the doctor to look at some lumps behind my ear, in front of my ear and this strange lump on my head. I thought I might have an ear infection, but these spots were warm to the touch and very tender. “Weird,” my doctor said. “We really need you to get a CAT scan like now.” I looked at her with bulging. frightened eyes and asked, “Why?” “We need to make sure that there is no bone cancer,” and she referred to a bunch of other medical terms, none of which I remember. I was fixated on the word CANCER. Oh Lord. 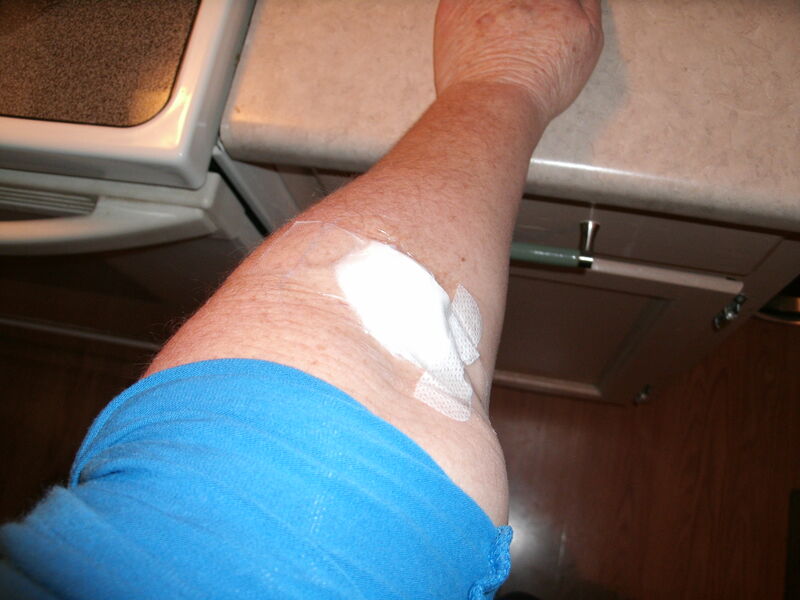 The IV was inserted, blood was drawn and I was left alone for about ten minutes waiting for results. Most people would take a snooze and I am one of those people, under normal circumstances, but not now. I was just lying there looking up at the tube that I knew I was going to have to enter. “Okay Beth, the labs look fine. Let’s get the process started.” She explained that when the die is inserte,d some people feel like they have a metallic taste in their mouth and can smell it as well. She also said that some people feel like they have to urinate but they don’t. I looked up at her, asked, “Are you sure I won’t pee? I have a very weak bladder.” She laughed. She proceeds to swoosh me into the tube, tilts my head to the left, shoulder to the right and requests me to lie really still again leaving me there alone. The ON button was ignited and the foggy tunnel now sounded like a huge vacuum. I was slowly hoisted into the machine when all of the sudden I could feel my heart rate increase. The sweat started forming around my upper lip. I quickly shut my eyes when all of thesudden the Bible came to life. I was recalling verses that I had not recalled in months. The 23rd. Yea, though I walk through the valley of the shadow of death, I will fear no evil: for thou art with me; thy rod and thy staff they comfort me. “KJV Okay God, I am convinced that nothing can ever separate me from your love. I need your peace to flow through my whole body, mind and spirit now! Please comfort me. I will fear no evil for you are with me. ” And so it was! I went from bandage to Bible in an instant. Whether we are filled with confidence or fear depends on the kind of thoughts that habitually occupy our minds. I knew in that moment I had to stand against the storm or in my case lie down through the storm. I thought no one was there to hold my hand, but I was wrong. Not only was God there to hold my hand, he was holding my whole body. We need to familiarize ourselves with biblical accounts that show us of what He’s done in the past and reveal His promises for the present and our future. Glad the outcome of the scan was good, but sorry to hear about the other problems you are facing with your health. It is so true that what we fill our minds with when things are going great determines how we respond when things get tough. We need to store up all those promises, and evidences of God’s faithfulness from the Bible, and also from our past experience, to draw upon in difficult circumstances. At times it is impossible (as in your case inside a scanner) to run and find a Bible to look up something encouraging, so we need to have it with us always, in our hearts and minds where no physical circumstance can prevent us from accessing it. Thank you for visiting and leaving a very encouraging comment. What a blessing to know that someone out there gets the fear at times. Today is a good day. I even got a 20 minute walk in and that’s good for me these days. I’m blessed beyond all measure! Oh, Beth, I didn’t realize! I’m so sorry! next time send me a text. (Or did you send an email and I just didn’t see it?) Sooo glad you don’t have cancer. You’ve really been on an emotional roller coaster with all this stuff!